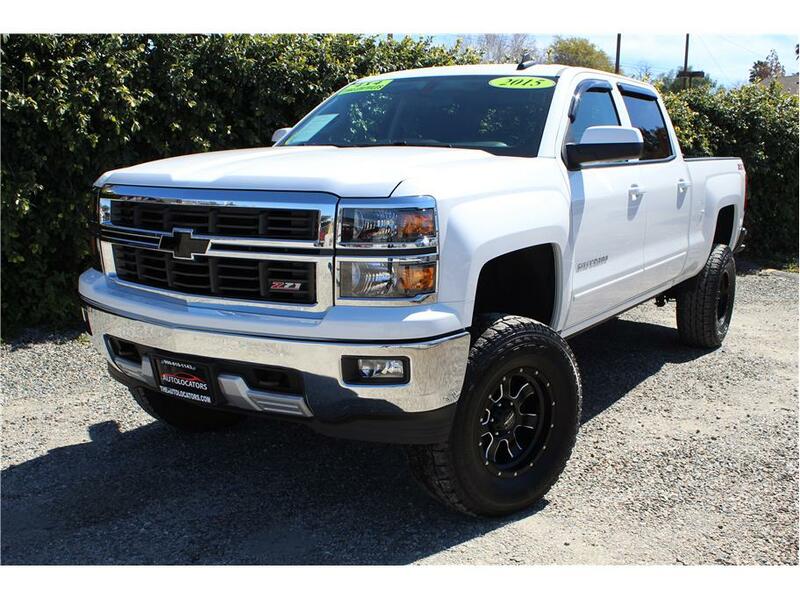 Home > > Vehicles > 23944 > 2015 Chevrolet Silverado 1500 Crew Cab LT SOLD!!! This 4×4 Z71 2015 Chevy Silverado Crew Cab has a strong Ecotec V8 5.3L engine with an automatic transmission and only 23k miles on it! Awesome aftermarket features like a Rhino lining spray in bed linear, 6 inch Pro comp lift, 315/70/17 Yokohama tires wrapped over brand new Pro comp wheels and AMP power folding steps. Factory features don’t fall short like the Z71 offroad package, touch screen media panel, Pandora app, Chevy MyLink, Bluetooth, Onstar Nav, Steering wheels controls, cruise control, Dual climate control, power group, driver power seat, fold down center console with storage, tow package and 4×4. Our Chevy truck just went a complete 151 point inspection by a California licensed repair shop and received a fresh oil change service, air filter, torqued all the suspension to factory specs and passed smog. This truck is ready for its next owner, come test drive it today!